Biomass is organic material made from plants and organisms. It is a renewable energy source. Photosynthesis, is the conversion of light energy into chemical energy in cells that contain chlorophyll, a green pigment. Photosynthesis occurs in most plants and algae and in some bacteria. The process is also called carbon fixation, because it includes the production of carbon compounds that store the chemical energy for use in cell growth. Biomass contains stored energy from the sun. Carbon dioxide plus water and the energy from the sunlight yields sugar (glucose), oxygen, and water. The chemical energy in plants gets passed on to animals and people that eat them. Photosynthesis occurs in plants, algae, and many species of bacteria. When burned, the chemical energy in biomass is released as heat. If you have a fireplace, the wood you burn in it is a biomass fuel. Wood waste or garbage can be burned to produce steam for making electricity, or to provide heat to industries and homes. The most common form of biomass is wood. For thousands of years people have burned wood for heating and cooking. Wood was the main source of energy in the United States and the rest of the world until the mid-1800s. Wood continues to be a major source of energy in much of the developing world. In the United States, wood and wood waste (bark, sawdust, wood chips, wood scrap, and paper mill residues) provide about 2% of the energy we use today. About 80% of the wood and wood waste fuel used in the United States is consumed by industry, electric power producers, and commercial businesses. The rest, mainly wood, is used in homes for heating and cooking. Garbage, often called municipal solid waste (MSW), is the source of about 12% of the total biomass energy consumed in the United States. MSW contains biomass (or biogenic) materials like paper, cardboard, food scraps, grass clippings, leaves, wood, and leather products, and other non-biomass combustible materials, mainly plastics and other synthetic materials made from petroleum. The average American produces more than 1,600 pounds of waste a year. If all this waste were landfilled, it would take more than two cubic yards of landfill space. That's the volume of a box 3 feet long, 3 feet wide, and 6 feet high. If that waste were burned, the ash residue would fit into a box 3 feet long, 3 feet wide, but only 9 inches high. Landfills can be a source of energy. Anaerobic bacteria that live in landfills decompose organic waste to produce a gas called biogas that contains methane. The following graph shows U.S. energy consumption by energy source. The whole 2009 energy review can be found here here. Biofuels are transportation fuels like ethanol and biodiesel that are made from biomass materials. These fuels are usually blended with the petroleum fuels — gasoline and diesel fuel, but they can also be used on their own. Using ethanol or biodiesel means we don't burn quite as much fossil fuel. Ethanol and biodiesel are usually more expensive than the fossil fuels that they replace, but they are also cleaner-burning fuels, producing fewer air pollutants. Under anaerobic conditions, the absence of oxygen, pyruvic acid can be routed by the organism into one of three pathways: lactic acid fermentation, alcohol fermentation, or cellular (anaerobic) respiration. Humans cannot ferment alcohol in their own bodies, we lack the genetic information to do so. Alcohol fermentation is the formation of alcohol from sugar. Yeast, when under anaerobic conditions, convert glucose to pyruvic acid via the glycolysis pathways, then go one step farther, converting pyruvic acid into ethanol, a C-2 compound. Ethanol is ethyl alcohol, the same type of alcohol found in alcoholic beverages. It is mainly produced with maize and is used primarily as a transportation fuel. In the U.S. most cars on the road today can run on blends of up to 10% ethanol, and the use of 10% ethanol gasoline is mandated in some U.S. states and cities. There is considerable debate over whether ethanol can or will replace gasoline as a primary transportation fuel. Many points are considered on this debate including the total energy balance from ethanol, and the production of ethanol in relation to food prices. The following graph illustrates the dramatic rise in production over the past decade of ethanol production. More data can be found here. Ethanol consumption has steadily increased in the past decade to about .8 quadrillion btu's a year in 2008. The U.S uses close to 100 quadrillion btu's of energy a year, so this is not very significant to our overall energy portfolio. 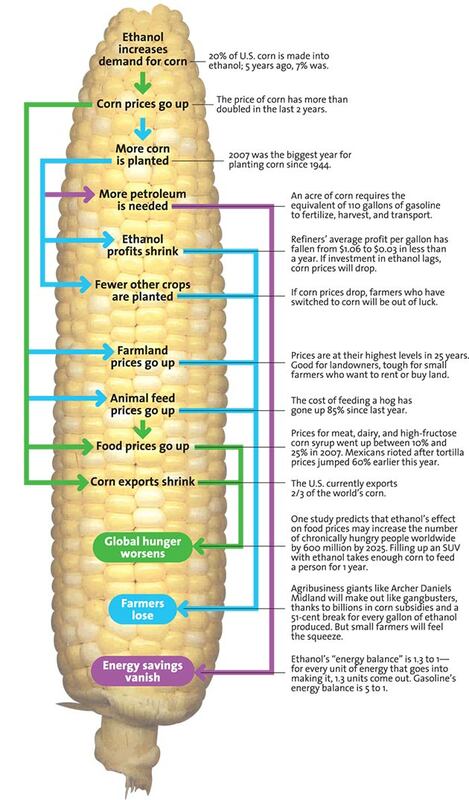 Ethanol's consumption is propped up by the fact that it is mandated by the government. It is because of this that future ethanol consumption is projected to closely correlate with gasoline usage. This can be seen by the proportion of ethanol that is used for transportation fuel over other uses. .786 of the .8 quadrillion BTU's consumed with ethanol were in the transportation sector. The Average BTU per barrel of ethanol is 1/3 less than that of gasoline. The United States has around 270 million hectares of arable land. 10 hectares, or 3.7% of the total arable land, is currently used for biofuel production. Projections for 2011 spot prices for oil from the EIA are $4.31 per MMBTU. Costs per MMBTU for ethanol range widely for a number of reasons. Different plants have differing production costs. Also, since this fuel is not as widely used as gasoline, transportation costs are much higher. The most defining factor for cost per MMBTU, is feedstock price. Since ethanol production relies overwhelmingly on corn, a small spike in corn prices can have an amplified effect on ethanol production costs. Average costs per MMBTU for ethanol centered around $12.50, close to 3x what oil is. 18.77/2= 9.385 mmbpd for transportation usages. Since the energy content of 1 barrel of ethanol is 1/3 less than a barrel of gasoline, the actual difference would be much higher. This results in an equal increase in arable land used for ethanol production. This means that 170 million hectares, or 63% of total arable land in the United States would have to be dedicated to ethanol production. Meeting domestic crude oil demand with ethanol increases prices of food, puts extra work on already strained water tables, and costs more money in general. Many other side effects are illustrated by the following picture. Ethanol is a novel concept when considering the insecurity of our oil supply and the problems Americans have with oil companies. A novel concept is where this fuel should remain, because it has no potential to really improve the situation of our energy supply. Much better alternatives exist, and focus should be placed upon them to further diversify the sources of energy America is powered by. Methanol or another alcohol is added to vegetable oil or animal fat in the presence of a catalyst, and the mixture is sealed and kept around 70 Celsius, the boiling point of alcohol. This process results in crude biodiesel (which is then further washed with warm water) and glycerin byproducts. Biodiesel is vegetable oil- or animal fat-based diesel fuel. Whereas ethanol is meant to be used in standard gasoline-burning engines, biodiesel is intended for use in diesel engines, and can usually be burned with little modification. Whereas ethanol is mainly produced from corn, biodiesel has a wide variety of sources, including algae, soybeans, and fats left over from food preparation. In the U.S., all diesel engines on the road today can run on blends of up to 20% biodiesel (B20) with no noticeable change in performance, and up to B100 with some modifications. Global production of biodiesel was 3.9 billion liters/year, or 32,710,000 bbl/year, or 89,608 bbl/day in 2005, with 2,070,000 bbl coming from the United States. The following graph illustrates the rise in production and utilization over the past few years for biodiesel. More data can be found here. In 2005, the US consumed 12 trillion Btu of biodiesel, and this number has only increased. The U.S uses close to 100 quadrillion Btu each year, so biodiesel does not contribute significantly to our overall energy portfolio. The United States currently consumes approximately 40 billion gallons of diesel ( per year for transportation. US biodiesel production in 2005 was 32,710,000 bbl/year, compared to 952,380,952 bbl/year of diesel consumed. Approximately 4% of America's diesel consumption in 2005 was met by biodiesel. Biodiesel is chemically comparable to fossil diesel, and lends itself to a full range of blends with fossil diesel. Better still, most diesel engines can run biodiesel with minimal modifications. Feedstocks are in no short supply for small-scale use, but, like ethanol, large-scale biodiesel production would be highly dependent on arable land availability, water availability, and environmental concerns with fertilizer and farming practices. However, recent research focusing on algae has shown promise, and should this path prove fruitful, we could see diesel fuel being harvested from waste treatment ponds across the country using fast-growing algae. As population grows, arable land will be harder to come by, so the success of biodiesel hinges upon serious technological breakthroughs.